Crestron’s airConnect is one of the most innovative location systems I’ve seen in a long time and promises to be the first viable one for the home. 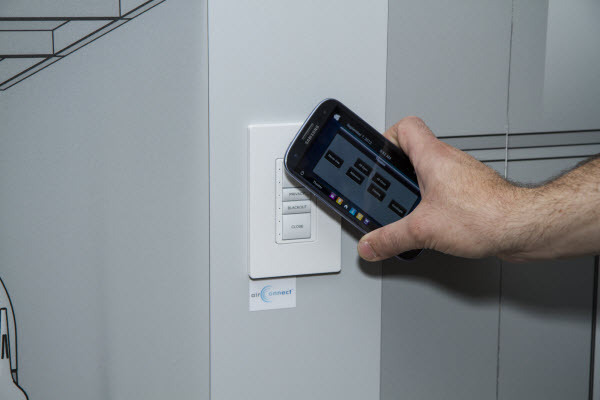 Rather than a typical RFID system that requires expensive readers to be located in several locations and hardwired back to a central location, Crestron’s airConnect currently works by using inexpensive Near-Field Communication (NFC) stickers that cost about $1 each. These can be located anywhere in the home (e.g. behind a light switch cover). A mobile device’s (e.g. a smartphone) NFC reader is then used to read the sticker and relay its ID (effectively a location) and the user’s ID back to the Crestron server using WiFi. The server software will then execute a pre-defined sequence of events based on the location and the user. This sequence of events would then be saved as the user’s macro that runs when they read the sticker near the front door. Allowing the user to reprogram things is a good, and long overdue, thing in the HA world. I installed my own system and I can’t tell you how many times I’ve tweaked event sequences. The user doesn’t want to call their installer to change the light level they set from 50% to 70%; furthermore, the installer doesn’t want the call and the paperwork to do such trivial task and bill them. 2. No need to carry an RFID fob. You almost always have what you need with you: your phone. What does the future hold for iOS users? It seemed to many (myself included) that Apple had potentially thrown a wrench in the works by omitting NFC support in the new iPhone5. For those of us heavily invested in the iTunes ecosystem and/or really like Apple products, swapping to an Android (or other) device is just not an option. I spoke to Dan Jackson, Research & Development Engineer at Crestron to see if anything could be done to integrate, the seemingly stranded, iOS devices with airConnect. Dan told me that airConnect will not be limited to NFC: it just happens to be the first technology brought to market. He thinks (as do I) that Apple will eventually implement NFC, but only when it becomes more widespread and they can monetize it with a killer app. Naturally, a technology leader such as Crestron, isn’t going to sit around for a year or two waiting for Apple. A technology in newer iOS devices that holds promise is Bluetooth 4.0, specifically its Proximity Profile. Coupled with Bluetooth Low Energy (BLE), a small device powered by a battery such as a CR2032, can run for over a year, making it feasible to locate several inexpensive Bluetooth around the home. The basic proximity profile will provide alerts when devices come in and out of range, but by using path loss analysis and multiple devices, it’s possible to do triangulation and even detect direction of travel with directional antennas. (tÅd is an example of a low power “beacon” based solution). At home, I’ve been experimenting with Bluetooth Proximity for a few months, and it works…sort of. I currently have my system setup to text me (while testing) when I arrive home or leave home and it works great. Ultimately, the goal would be to do things like disarm the alarm, unlock doors, etc. The problem is that basic proximity detection is way too simplistic for most things. For example, if the battery dies on my iPhone, or I wrap it in aluminum foil (doesn’t everyone do that occasionally? ), my house “thinks” I’ve left. Clearly, a much smarter solution is required. With better smarts and better location detection and directionality, it would be much easier to infer (accurately) that I’d left the house vs. my Bluetooth shutting off. Is Bluetooth a match for NFC or even better? With accurate location detection, a similar level of functionality to NFC could probably be achieved. Rather than tap to act, the user could press a button on their phone (or any touchscreen/keypad) and, if the location detection system could determine their position accurately, the system would know who pressed the button. Potentially, this could offer much more flexibility than NFC. Rather than having to dot stickers around the house, I could touch any light switch, keypad or touchscreen (or any other myriad of devices) and the system would know (as long as I had my phone with me) who caused the resulting event, and possibly their direction of travel. Knowing it was Mark entering (rather than leaving) the bedroom, could set the lighting, etc. to my desired levels based on the current time of day. To do this with NFC would require stickers inside and outside the door to indicate entrance and exit. Not an issue at $1 each, but that means double the setup and maintenance and with too many stickers, you’ll end up needing an app to remember where they’re all located! How suitable is Bluetooth for a location detection system? RSSI is an integer that denotes whether the received (RX) power level is within or above/below the Golden Receiver Power Range (GRPR), which is regarded as the ideal RX power range. In the past it has been used to determine when to send an increase/decrease Transmit Power Level request to a transmitter in order to improve link quality. This is an integer which specifies the Bluetooth module’s transmit power level (in dBm). This is an integer value that represents the perceived link quality at the receiver. For most Bluetooth modules, it is derived from the average bit error rate (BER) seen at the receiver, and is constantly updated as packets are received. The exact mapping from BER to LQ is device-specific. By using these attributes to calculate path loss, it should be feasible to determine the distance of a device from a “beacon”. With multiple connections and direction antennas, we have triangulation and direction too. Crestron isn’t resting on its laurels waiting for Apple, so there’s hope for iOS devices. Dan stated that so far they haven’t hit anything insurmountable, but a fair amount of research and development is still required to build the smarts that would result in a robust, reliable solution, such as you’d expect from Crestron. So, iOS users: don’t despair. There’s a light at the end of the tunnel and I’m pretty sure it’s not an oncoming train. I’ll certainly be following airConnect very closely.